The essential name of the Almighty Creator, which is confirmed by the religion of Islam, "Allah" has no dictionary meaning. With the exception of this name, all other names that describe Allah in the Holy Quran are known as the Asma ul Husna following the revelation: "The most beautiful names belong to Him (Allah)." (Surah Al-Hashr, verse 24). The phrase Asma ul Husna, made up of the word asma, the plural for "name", and husna, meaning beautiful or most beautiful, means "Allah's most beautiful names." The names which are attributes of Allah can be found in the Holy Quran and the sunnah. The Asma ul Husna awakens respect in servants toward Allah, connoting Allah's sublimity and transcendence. These names, when used in dhikr - remembering Allah - and in supplication, lead to the acceptance of prayers and result in the accumulation of good deeds. These names fill the heart with a peace of mind and tranquility, as well as an awareness of Allah's mercy and bounty, which affirms hope. Because the value of knowledge is dependent on the value of those who possess knowledge and the most honorable of those with knowledge is Allah, those who know the Asma ul Husna have greater honor and virtue. Because the Asma ul Husna comprise adjectives such as wajib, jaiz and mumtani ( that which is true for Allah that which can or cannot be true for Allah and that which can never be associated with Allah) they provide us with sufficient and correct information about Allah. It is not possible to delineate the names of Allah or divide them into sections; like a circles that have been linked together, they are all connected and related to one another. The correct knowledge of Allah will release a person from all worries and superstitions, as well as from groundless assumptions. A person who bases their knowledge of Allah on information that emanates directly from the Creator instead of their own assumptions will be able to attain mental and spiritual clarity. A person will feel the need to make a connection and establish a relationship with Him in their heart and not just with their mind. The role played by the Asma ul Husna is very great in this respect. It has been observed that in the prayers that have been related through Prophet Muhammad (pbuh), the Asma ul Husna are frequently mentioned. The human soul seeks perfection. When it learns of the perfection of something, it is drawn there and experiences joy parallel to the level of perfection found. Just as knowing Allah is possible through learning His name and attributes, loving Him is only possible through knowing that all perfection lies with Him. In short, learning the Asma ul Husna will provide knowledge of Allah. The knowledge of Allah is the seed of love for Allah. When a seed falls onto the heart, it sprouts, growing into a tree of eagerness and love. The fruits of this tree appear and ripen in the heart, the soul, the hands, feet, eyes and ears - in both our physical and spiritual existence. These fruit are sincere virtues, such as respect for the Creator, mercy for creation, liberation from bad habits, acquisition of good habits and enduring all kinds of hardships in the way of Allah. According to a hadith narrated in Bukhari and Muslim, Prophet Muhammad said the following about the Asma ul Husna: "Allah has 99 names. Whoever memorizes and embraces (ihsa) these qualities will enter heaven." The meaning of the world ihsa is emphasized, with the view that this word means more than the mere dictionary meaning of "counting, memorization and understanding". In this context the word ihsa includes the meaning "Understanding Islam's belief in the Divine by resorting to evidence from holy verses, espousing these beliefs and attaining a level of spiritual perfection that is befitting to this belief." Ninety-three of the names that are mentioned in the hadiths are also in the Holy Quran, while the meanings of the other six names have been attributed to Allah with different words. 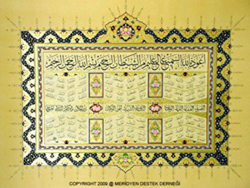 This list [of names] has become popular in the Islamic world, and is read as a prayer and supplication; the Asma ul Husna have also become a subject for Islamic calligraphy. In one of his prayers to Allah Prophet Muhammad, while mentioning the level of appearance and knowledge of the names of Allah, stated "...or your names which you left to the science of the unknown and chose for yourself," thus informing us that there are other names belonging to Allah which are not known or apparent to us. The 99 names of the Asma ul Husna, if examined with love and respect, joy and sorrow, can be its inability to be understood merely in terms of love and blessing . Nor would it be right to describe the Almighty Creator, Who forms a part of the large mechanism that is visible in both animate and inanimate nature and Who is in a constant state of action and reaction, in terms of fear or sorrow. The Asma ul Husna, the most beautiful names of Allah, are mentioned in the Quran in Surah Al -A'raf, verse 180, Surah Al-Isra, verse 110; Surah At-Taha, verse 8 and Surah Al-Hashr, verse 22-24. The Holy Quran tells us to pray to Allah by using His most beautiful names in Surah Al-A'raf, verse 180 and Surah Al-Isra, verse 110. The verse "The most beautiful names belong to Allah: so call on Him by them; but shun such men as use profanity in His names: for what they do, they will soon be requited" (Surah Al-A'raf, verse 180) warns us that attaching meanings that are not befitting to the Creator and comparing other things with Allah or giving attributes which describe Him or His names to anything other than Him is seen as "going down the wrong path with regard to the Asma ul Husna." 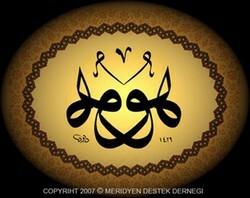 The names of Allah lead to the discovery of perceiving His existence. That is to say, only the names which are mentioned in the verses of the Quran and hadiths can be used for Allah. One can not randomly assign names to Him. Allah has given Himself His own names. A name other than those found in the verses of the Holy Quran cannot be associated with Allah. For example, it can be said that Allah is Al-Alim (All-Knowing); however, one cannot say that Allah is "Wise" or "Knowledgeable", as these do not appear among the 99 names. Some of the attributes of Allah found in the Holy Quran are names that consist of a single word, whereas others are a combination of names. The one-worded names total 99 in number. These names have been divided into three: the Jalal, Jamal and Kamal. The attributes of Allah that fall under the name of Jalal are known to us through His infinite and divine Majesty which are apparent through His creation throughout the universe. The attributes of Jamal, on the other hand, become evident with their plentiful blessings, which we respond to with gratitude. The Kamal names reveal works of art that have been created with perfection and wisdom and invite people to contemplate on this. Allah has hidden the Ismi Azam (the greatest of all His names) within His names. The wisdom behind this is to maintain His servants' desire for the Asma ul Husna and allow prayer to be made by using all of His names. Islamic scholars hold differing opinions about which of Allah's name is the Ismi Azam from the Asma ul Husna. The opinion of most scholars is that if any name has the attribute of being the "greatest name of all" this would have to be "Allah", due to the scope of its meaning. According to a hadith, a person made the following supplication next to the Messenger of Allah: "Oh Allah, You are Allah, of which there is no other worthy of worship. You are one, ya Samad. You have not begotten, nor were you born. There is nothing equal or like you." Prophet Muhammad, hearing this supplication said: "I swear on the entity Who holds my life in His hands, this person asked from Allah with the name of the Ismi Azam. Know that whoever prays with the Ismi Azam, Allah will answer him. Whatever you request with it, Allah will certainly Grant this wish." From this, we gather that the Ismi Azam is in fact in the Surah Al-Ikhlas. It is said that for ones to learn Allah is to learn about one selves. Learning and experiencing the attributes of Allah in one selves is a start for knowing and getting closer to Him. InsyaAllah. MashAllah this is a beautifully written article. It has informed me as well as inspired me to learn more about Allah. Thank you very much for sharing. May Allah reward you. JazakuAllah Khair.